When Gosei, a supernatural being, and his robotic assistant Tensou discover the impending invasion of the Warstar aliens, they call upon five teenagers with attitude to form the newest Power Rangers team, Megaforce! I love the Power Rangers, but I admit other than standard promo images and what can at best be called “incomplete” or simply reused Sentai footage, I’ve been a bit hard pressed to find out more about the Megaforce series. I follow a few die hard Ranger bloggers and fans on Twitter and was a bit surprised to find that Nickelodeon wasn’t exactly promoting Megaforce that much. This is the 20th season/anniversary of the superhero series and I was expecting BIG things from them. But it’s hard to know what kind of big things to expect when there’s really not much out there. I’ve learned about the team and even the upcoming Legend War adaptation through translated Japanese magazine articles, fan websites and Twitter! SO, for the Ranger fans out there that aren’t searching the web like I have been. Here’s a BASIC sum up of the team for you! Troy is the new Red Ranger and the new kid in town. It looks like his upbringing will be portrayed as a bit rough and “not normal” but is a great and natural leader. Troy is also having visions while he sleeps, visions of Rangers from the past battling an unknown army. He will be in control of the Dragon Zord! Emma is the new Pink Ranger. Emma is a nature lover and will do anything to protect and preserve it. While Emma comes off as the stereotypical “Sweet” Pink Ranger, she’s deep down a BMX riding tough girl who is not to be underestimated! Emma pilots the Phoenix Zord! Gia is the Yellow Ranger. Gia is good at EVERYTHING she does, school, work, and even martial arts. Though she has climbed the social ladder, she is still best friends with Emma. She pilots the Tiger Zord! Noah is the Blue Ranger. A tech geek that somewhat lacks physical coordination but more than makes up for it with his intelligence. Noah is out to change the world and make it a better place, though fighting for it may not be his first choice, he’s more than able to stand his own ground! Noah pilots the Shark Zord! I’m sure by now you’ve realized the Rangers are, in their own ways, much like the original Mighty Morphin Power Rangers team though the personalities may have shifted colors slightly. Even Gosei and Tensou are analogs for Zordon and Alpha 5! The 20th Anniversary Megaforce looks to try and recapture the old magic for older fans, while giving younger and new fans something exciting to watch as well! Like previous seasons, more allies, zords, weapons and enemies will show up through this season and the next (Yes, Megaforce like MMPR and Samurai will be two seasons long!) 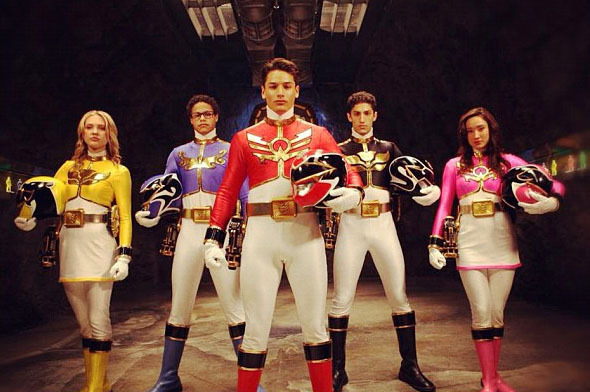 So make sure you tune in and let the folks at Nickelodeon know that we’re ready for Megaforce!! ← Girl Meets Worlds casts Cory & Topanga’s daughter!